Following a successful Trojan’s Trek Board workshop held in Adelaide on 31 Aug, the board of Trojan’s Trek met with the board of RSL Care SA to share information and as social interaction. The meeting received an update from Ben Challinor, the manager of the Andrew Russell Veteran Living (ARVL) centre which provides accommodation for homeless veterans. Through ARVL, RSL Care SA seeks to provide veterans with accommodation support to assist them get back on their feet. The meeting was also updated on Trojan’s Trek operations in SA and QLD. 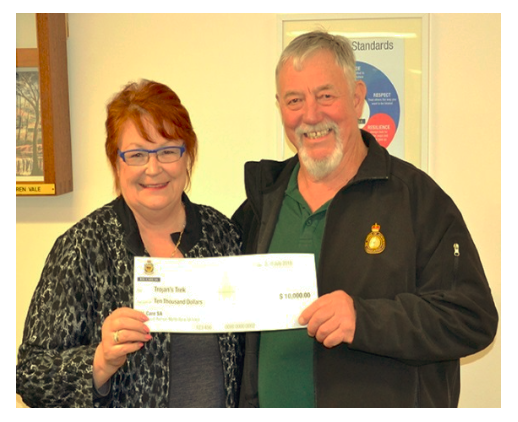 At the conclusion of the meeting, Loretta Byers, the chair of the RSL Care Board presented a $10,000 cheque to the Chair of Trojan’s Trek, Moose Dunlop OAM, as a contribution to the continuation of the good work of the program. Tags: Andrew Russell Veteran Living, ARVL, Ben Challinor, Loretta Byers, Moose Dunlop, RSL Cares SA, Trojan’s Trek Board workshop.